Our very own Dunkin’ Donuts restaurant and franchisee, Steve Rubiano, was recently featured on Animal Planet’s hit television series, Tanked, where the largest aquarium manufacturing company in the nation made a very special tank for his Dunkin’ Donuts restaurant in Riviera Beach, Florida. We talked to Steve about his experience working on the show and with Acrylic Tank Manufacturing (ATM) and the creation of his DD inspireDD tank. 1.) 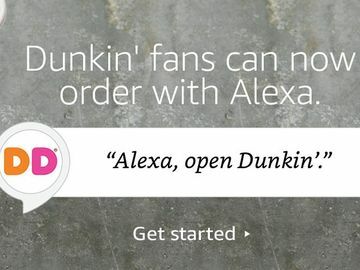 Tell us a little bit about your life as a Dunkin’ Donuts franchisee. 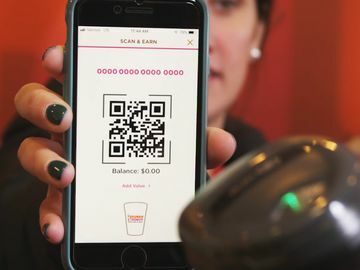 I’ve been a Dunkin’ Donuts franchisee since 1998 and I currently own three Dunkin’ Donuts restaurants in Florida, located in Riviera Beach, West Palm Beach and Lake Worth. I’m originally from Rhode Island so I grew up with the brand and it’s a great company that I’m glad to be part of. My favorite part about being a member of the Dunkin’ Donuts franchisee family is all of the friends I have made over the years. There are great people that are a part of this company and I’ve enjoyed maintaining these friendships and relationships. 2.) How did the opportunity with Tanked come about? I was on a family vacation with my four children in Las Vegas and we were visiting a few of the TV sets that are based there, including Animal Planet’s Tanked. When we went to visit the Tanked set, the stars of the show, Wayde King and Brett Raymer, were there taking pictures with visitors. 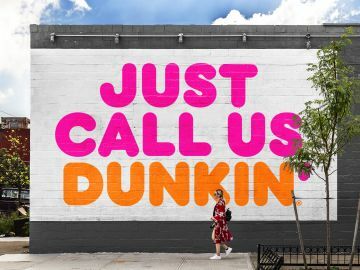 Since they’re originally from New York, they know all about Dunkin’ Donuts and I asked them if they would be interested in creating a tank for one of my DD restaurants. I even sent them some coffee a few weeks after I met them to remind them that I would love to feature my DD restaurant on the show for a tank. 3.) Why did you want to put an aquarium in your restaurant? My son is a big fan of the television show and we also had aquariums in our home for my children growing up. 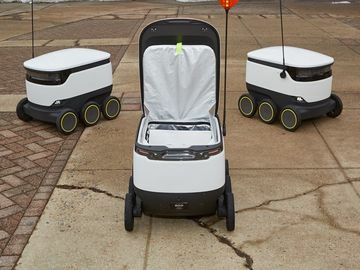 They are really fun and add a unique feature to a room. I wanted a tank in my restaurant to make it a destination point where my guests can come in and enjoy the atmosphere. I thought putting a great aquarium in my restaurant, especially one with a fun design, would be something that they would really enjoy. 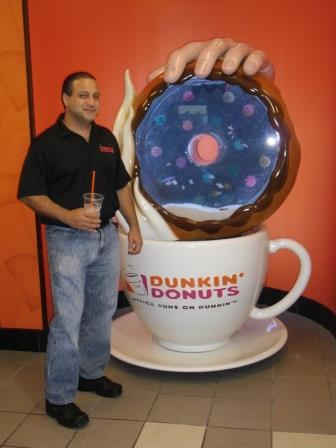 Dunkin’ Donuts franchisee Steve Rubiano. 4.) What type of experience did you want to provide your guests with this aquarium? 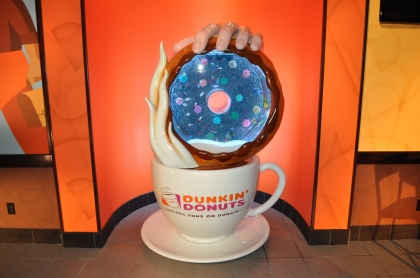 I wanted a cool design of the tank to represent the Dunkin’ Donuts brand and to appeal to my guests. I find fish tanks to be very relaxing so I wanted to add this element to my restaurant so guests can come in and enjoy their coffee and food while watching the fish in the tank. 5.) What did you envision for the design of the tank? My original idea was to have the double D’s as the tank, but I left it up to the experts and they came back with some great designs. We ultimately ended up choosing the cup of coffee with the Dunkin’ Donuts logo and the hand dipping the donut into the coffee. We felt this was a great representation of the brand, especially with the chocolate frosted sprinkle donut. 6.) What are some of your favorite features of the tank? We have about 20 different fish in our salt water tank and I think my favorite is the Purple Tang Fish. Another great feature of the tank is the 1,200 different LED light combinations we can change to. I also really like the bite that’s taken out of the donut where guests can look into the tank from a different view. 7.) What types of reactions and feedback have you received from your guests on this new addition to your restaurant? I’ve received very positive feedback from the community and our guests. The guests think it’s a great addition to the restaurant and they love looking at the cool fish we have. I actually had guests travel here from Orlando which is about two and a half hours away to check out the tank and take pictures. 8.) What was it like working with Wayde and Brett on Tanked? This was my first time working with a TV show and it was such a fun experience. Wayde and Brett are just two regular guys who love what they do. They’re really funny and we worked very well together. 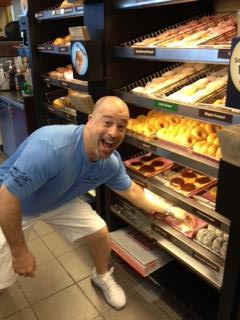 Tanked star Brett Raymer picking out one of our DDelicious donuts for a snack! 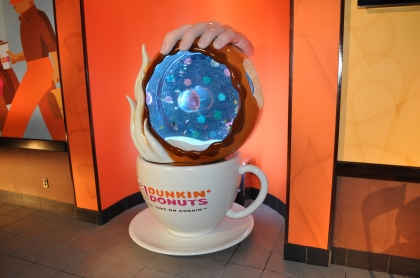 What do you think of this Dunkin’ Donuts inspireDD tank? Tell us on Facebook and Twitter!